Med den här balunen kan man skicka komposit och stereo ljud upp till 670 meter via en enkel Cat 5 UTP nätverkskabel. Balunen kan även användas tillsammans med Muxlabs Distributions hub för Audio / Video. The Stereo Hi-Fi/Video Balun allows a single composite video signal to be transmitted via unshielded twisted pair (UTP) cable up to 2,200 ft (670m) in a point-to-point connection. The Stereo Hi-Fi/Video Balun features full audio bandwidth response for high fidelity applications and features built-in color-coded cable leads for ease of installation. 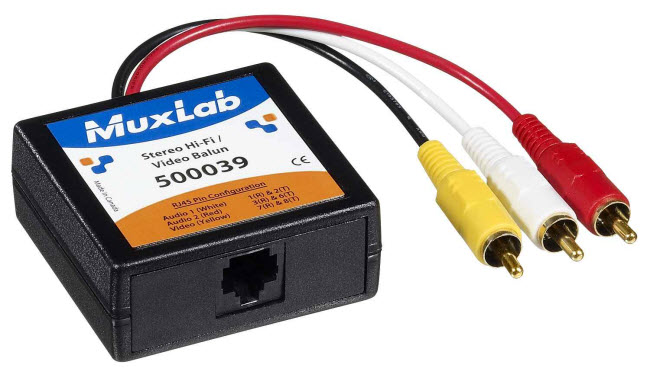 The Stereo Hi-Fi/Video Balun also works in conjunction with MuxLab's Audio-Video Distribution Hub (p/n 500200) to allow composite video programming to be distributed via UTP.